Yin and Yang in the groin. The patient had undergone emergent angiography and PCI for a STEMI. Access for the PCI was gained through the radial artery, which is associated with fewer complications than femoral artery access. Unfortunately, they also required placement of an intra-aortic balloon pump, which was placed through the right femoral artery. At a follow-up appointment soon after discharge, examination revealed swelling in the right inguinal crease. The swelling was both pulsatile and had a sharp systolic bruit. 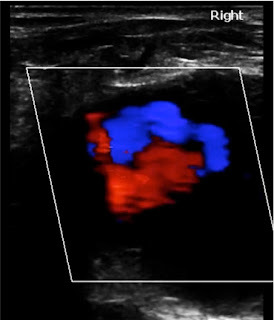 Point-of-care ultrasound (POCUS) of the area of pulsatility was conducted with both B-mode and color Doppler. The physical exam, of course, had been strongly suggestive of a pseudoaneurysm of the femoral artery. The POCUS is diagnostic! The B-mode image shows a large pulsatile hypoechic structure, but a post-operative hematoma might have the same appearance (e.g. if an adjacent artery was causing pseudo-pulsation). 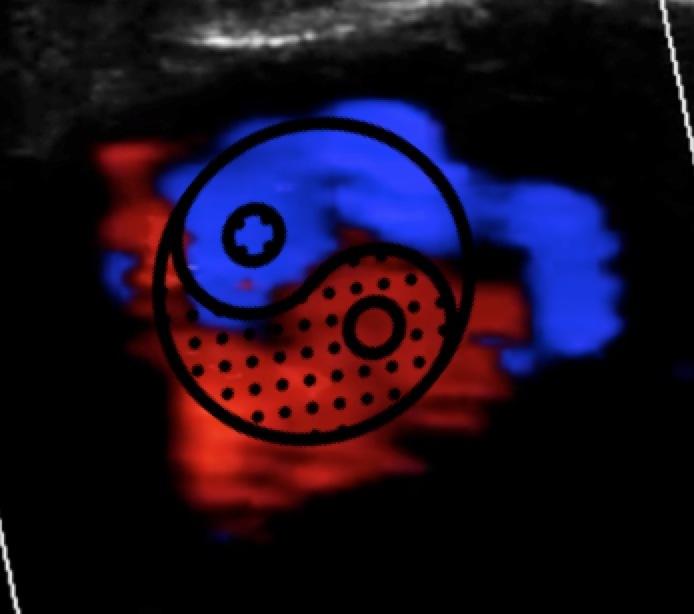 Color Doppler is required to exclude hematoma by demonstrating pulsatile flow within the structure. Such flow may appear as a "swirling" or "to and fro" pattern. Even more "colorfully" (pun intended), the pattern has been described as the Yin-Yang sign. Treatment can be as simple as ultrasound-directed compression of the pseudoaneurysm sac, or as invasive as surgical management. The majority of post-cathetererization pseudoaneurysms, however, are managed with injection of thrombin into the sac. This is almost always successful. A young adult presented to the emergency department with chest pain and shortness of breath. They had had an ICD placed years ago, but this had been removed a month ago after they had been developed bacteremia. A large vegetation had been found on the right ventricular ICD lead, and the post-removal echo had been normal. A PICC in the right arm was delivering antibiotics. The chest discomfort was modestly pleuritic, and they endorsed recent development of a cough and chills. A chest X-ray was interpreted as showing an infiltrate, so antibiotics for health-care associated pneumonia were started. What two findings suggest further imaging? First, the dramatic, circus-like tricuspid regurgitation suggests either a new problem with the valve, or new pulmonary hypertension. Comprehensive echocardiography is indicated to investigate the valve and assess for pulmonary hypertension. But why is there TR? Probably because of the little gusano in the RA that the red arrows are pointing at. Although RA masses have a broad differential, the history (a recent normal echo, PICC, recent hospitalization) obligated consideration of a pulmonary embolism. Which the the patient had: A CT scan revealed that the "infiltrate" was hiding a PE. Venous emboli in transit through the heart are often described as "worm-like" or serpiginous in appearance, although other morphologies are described. Other signs of venous thrombolic embolic disease are typically present, and a PE is diagnosed through complementary imaging, as was the case with this patient. It is crucial to highlight, however, that a point-of-care ultrasound may be the sole test that suggests VTE. A recent case report by Minardi et al. described a patient with a history strongly suggestive of PE, and a right atrial mass but a negative CTA for PE. Although the RA clot seemed obvious on the screen of my US machine, it has been pointed out that my clips above are not unambiguous. Well, it doesn't help to simply sputter "It was there, I tell you!" Instead, let me offer a clip from the formal echo that was obtained soon after my focused ED echo. WARNING: While it demonstrates more clearly the mass in the RA, the quality of the clip here is, quite frankly, horrid. A woman with sickle cell disease, CAD, and pulmonary hypertension came to the ED with dyspnea, and a focused cardiac ultrasound (FoCUS) was performed. 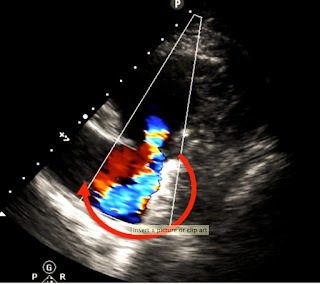 An atrial septal aneurysm (ASA). This is infrequently seen, and has been described as a benign congenital abnormality in the past. However, much like a PFO, there appears to be an association with cerebral emboli. Criteria for ASA aren't completely clear, but a common definition requires ≥ 10 mm of atrial septal excursion. In the picture below(from an open-access article), the total excursion = a + b. Emergency physicians have learned to recognize a number of cardiac conditions besides the 4 or 5 problems usually sought on a FoCUS. With increasing utilization, however, rare abnormalities will be increasingly identified in the ED. An ASA found on FoCUS does not require urgent therapy, and outpatient referral to cardiology would most likely be appropriate. On the other hand, if an ASA is found in a patient being investigated for a suspected acute stroke, this finding should be discussed with cardiology, since specific echocardiographic testing (e.g. bubble test for PFO, a TEE for atrial thrombi) may be pursued. Butterfield, Michael, Christine Riguzzi, Oron Frenkel, and Arun Nagdev. “From the Heart: Interatrial Septal Aneurysm Identified on Bedside Ultrasound.” Western Journal of Emergency Medicine 15, no. 6 (September 2014): 719–20. doi:10.5811/westjem.2014.7.22972. Mügge, Andreas, Werner G. Daniel, Christiane Angermann, Christoph Spes, Bijoy K. Khandheria, Itzhak Kronzon, Robin S. Freedberg, et al. “Atrial Septal Aneurysm in Adult Patients A Multicenter Study Using Transthoracic and Transesophageal Echocardiography.” Circulation 91, no. 11 (June 1, 1995): 2785–92. doi:10.1161/01.CIR.91.11.2785. What changed in the second echo clip? A young adult was brought to the ED with seizure versus syncope, and an echocardiogram was performed. These two clips were obtained within seconds of each other, and I've combined them in sequence here. Of course, color Doppler is being employed in the second clip, but there is a subtle abnormality. Perhaps it would be helpful to see the cardiac rhythms. These show, respectively, a long QTc and Torsades de Pointes. The patient had no pulse during the second recording. A middle-aged male presented to the ED with dyspnea. He had a history of both severe ischemic cardiomyopathy, as well as poor adherence to outpatient care. He had not seen a physician in 2 years. He was mildly hypoxic, and had clinical signs suggestive of heart failure. 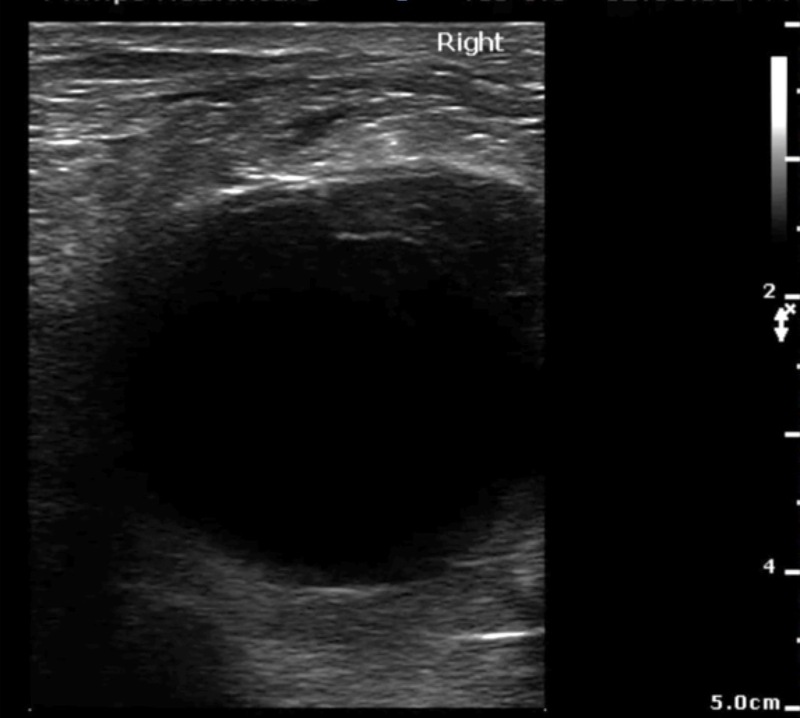 Point-of-care thoracic ultrasound demonstrated US B-lines. 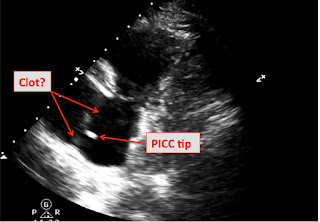 A focused cardiac ultrasound was performed, and apical 4-chamber view obtained. What does the echo show? 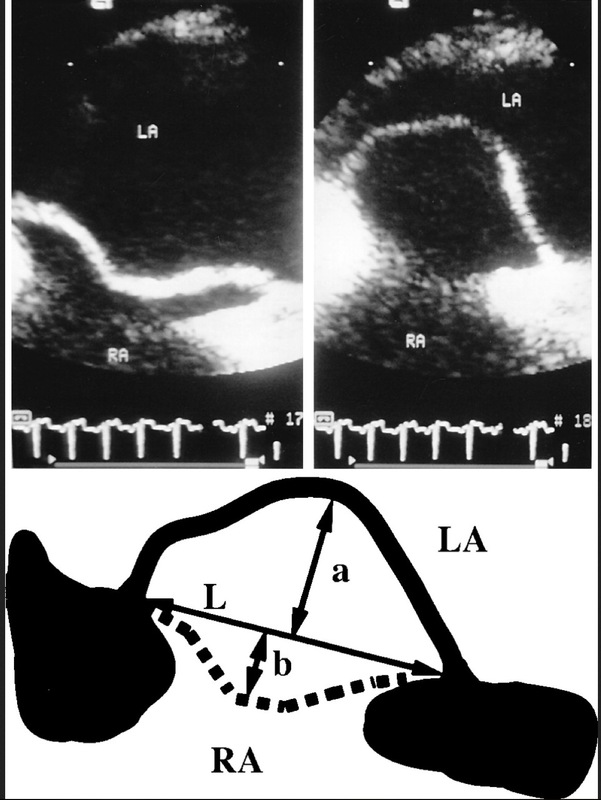 There is marked systolic dysfunction, which is not significantly different than his prior echo report suggested. However, in contrast to the thin septal wall, the apex appears thick, but akinetic. It also seems oddly trabeculated. Sometimes, an obliquely directed A4C view can produce a foreshortened and thick "apex," but that isn't the case here. This is instead a left ventricular thrombus. LV thrombi can form in the LV, especially following a large anterior MI that produces a large region (especially the apex) of akinesis. These used to be more common in the past, but are only infrequently seen now in the days of lytics and PCI. The rate of embolic complications appears to have decreased in the reperfusion era. Treatment with lytics, heparin, or oral anticoagulants haven't shown an unequivocal benefit. Given this patient's problems with adherence, anticoagulation was defered.